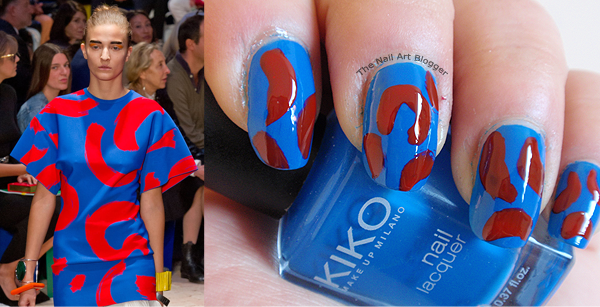 This time my inspiration came from the Céline Spring 2014 Runway Show at the Paris Fashion Week. 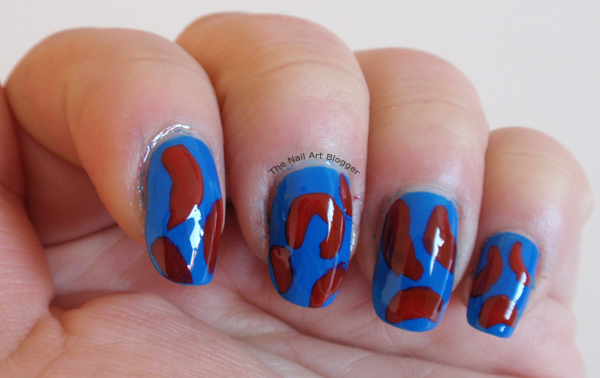 A lovely blue background with red brush strokes. Or at least, I think it's brush strokes. It looked so beautiful that I decided to try it out. 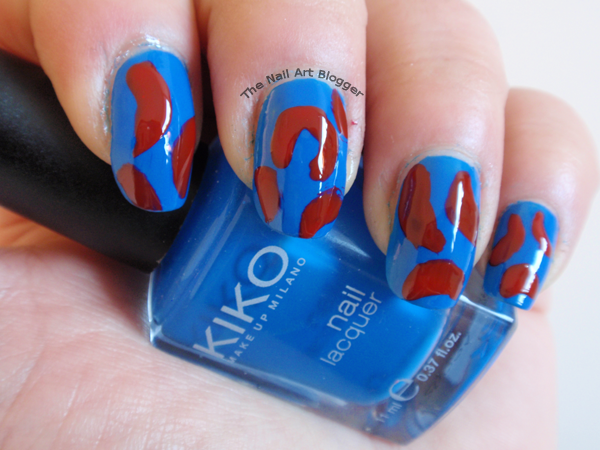 I started off with my usual Essence XXL nail protector base coat, and topped it with two layers of the #294 from Kiko. A very lovely shade of blue. Unfortunately, Kiko polishes don't have names. Then again, have you seen their collection at their stores? It's humongous! I never want to get out of the store once I'm in. 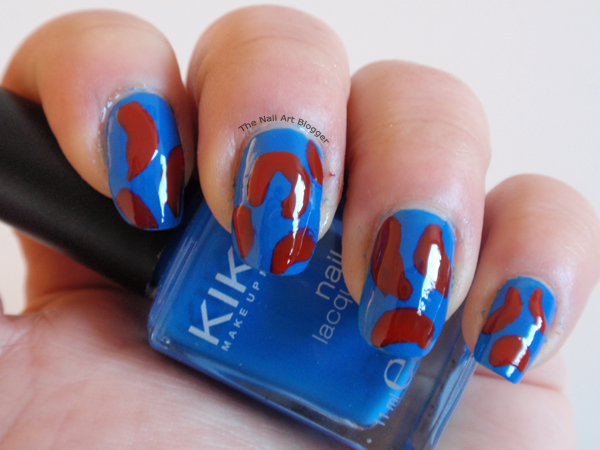 Anyway, back to the nail art! 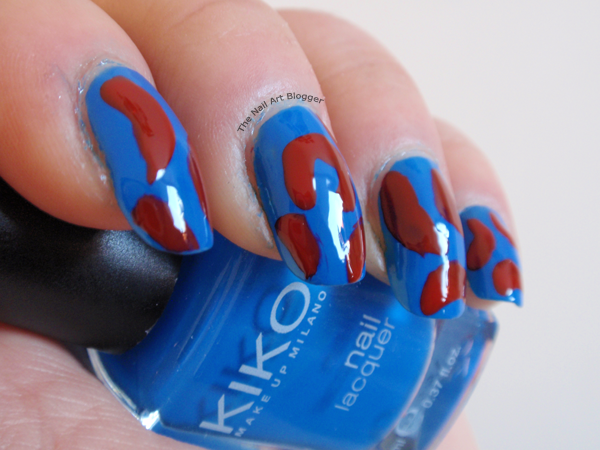 I waited for the blue to dry before I went and grabbed the red of the 06 Red & Mandarin from the Multi-Effect nail lacquer collection by Kiko. And using its own brush, which is nicely thin, I made some random strokes. I did two layers of the red as well. The second one a bit more careful so I wouldn't mess it up too much. I think I should have started the strokes with white, and then went over it with red to get a more vibrant shade like it is on the dress. Once everything was dry, I topped it off with the 8in1 Nail Wonder from P2. This top coat is lovely, but it feels like it never dries completely. I continue getting dents even on the next day. I should either look for a new one, or come up with a way to avoid dents. Other than that, the shine it gives to the nails is exactly the way I like them. Not too glossy, but shiny enough. Have you been inspired by fashion lately?